The first thing I want to say, is the read line, I thought unbreachable, was breached in a large manor. We can see though, there was a lot of built up energy before it happened. So the moral to this story is, nothing is perfect, but I do my best. Now, this is the Dow, which hit a turning point today, which is obviously a high, the highest closing ever. Now the panic cycle I believe, is to bounce off the junction of these two lines on Monday, and then it's off the the races. I think Monday's action will be limited, and I can't even say what I think the S&P will do, it might finish up. That is the 14th. The 15-16 is the real crash, and it looks like the S&P will finish down on the 17th as well. The other thing to take note of, after a rally like that, you have to think stocks are overbought right? I can't really fit this into the weekly array that I've seen. It said this week was not going to be significant. I'm thinking my conspiracy theory is accurate. They rigged the system to buy them a few days to position for a crash. Has any one checked whether or not the Armstrong arrays are accurate? 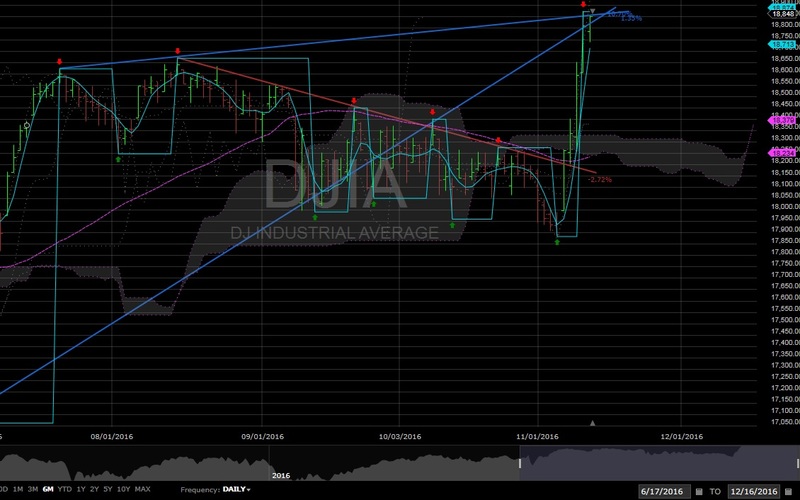 About 8 weeks ago i plotted the average of the daily open and close price off the DJI (perhaps it was the S&P?) against the bars in two consecutive Armstrong arrays. I found. 1) on all but 4 occasions the directions agreed, 2) there was little relationship between the height of the bars in the Armstrong arrays and the value of the open/close averages, except that it was largely positive, 3) the bars coloured blue were up days and the fuchsia bars, down days, 4) turning points were where the bars suggested ie the highest bars indicated a local max and the lowest fuchsia bars a local min. They are accurate, the shortfall is they are sometimes hard to read. The height of the bars is not the price. Joe, how did the market perform against the Armstrong array? Are you still on track with your plan?